Custom Printed. Orders Shipped Within 30 Days of Art Approval. Our Wood Coins appeal cross-gender from young to old, tall or short, with their beautiful clean smooth look and feel. These coins hold proclivity to avoid the trash bin that spells the end to so many similar trinkets, doodads, pens or even the ubiquitous business card. When actually thrown toward the proverbal round file, the flight-path is very inaccurate and somehow they land in a top drawer, on a fridge door or in a jewlery box, poised for years. Collected and traded with vigor for decades throughout the world “Wood Exonumia” is the back bone of “Dendro-Numismatics”. Get with it will ya, just ask grandma or grandpa. 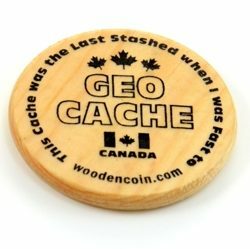 Wooden Coins have a North American history of well over a century. We help roll the bandwagon of yesteryear and turn away from plastic mementos and the toxic enamel pins produced a mere jet ride from Whocanguess in the land of Slaveakid. Take advantage of the diversity of natural wood and use Beetle Kill Pine to rekindle the past practice of coining your message or memory for eternity with sleek wood coins. We have produced more than 150,000 Wood Coins to date. Pine must be the best wood of choice, for billions of Pine Beetles can’t be wrong. Clifford Claven notes: “These here Wood Coins mail well”. Made within Canada, amid beetle killed dead pine trees, your custom message printed on a coin of gorgeous wood, sealed in a non-toxic, child-safe lacquer so as to be treasured, stashed, retrieved and displayed for years to come. Because if you don’t have one you want one; Don’t you! Woodencoin.com’s manufacturing facility is located in the small town of Likely in the Cariboo Region of British Columbia, Canada. History had this town of 350 sitting mid-stream of the attack of the Pine Beetle at the turn of 2000. Soon all Pine trees in the surrounding area were dead and diminishing in value and the beetle had moved on. Some of Jim Smith’s earliest memories as a child are of his neighbor Fred displaying a handful of wooden coins which captivated him. Many decades later, involved as foreman in the restoration of a local 1859 Gold Trail ghost town Jim chose this event to scratch “make some wooden coins” from his bucket list of life. potential with an immense appeal to most all who hold one, young or old. Years later a company developed which in 2010 boasts 100,000 Wooden Coins produced. Wishing to advance this small town, hit hard with the forestry downturn, WoodenCoin.com plans to remain in this very remote location. Secondary wood processing and finished products are a natural progression to the original drive of the fiber harvesting of yesteryear. The more value added processing that could be applied within this province the more we would all benefit greater return from a renewable public resource. Your order will help generate income and strength to this small community. Local residents produce the Fridge Magnets and Lapel Pins at their home for a very reasonable pecuniary return in a diminished employment environment. Help turn the onslaught of a devastating bug into a smile inducing Wooden Coin product. Our Wooden Coins are made from BC wood harvested due to the attack and impending devastation of the Pine Beetle. Since our product utilizes such a small sample of wood, in the future we can change to other tree species with no negative environmental impact. woodencoin.com is committed to understanding and implementing the ever changing eco-friendlier systems of silkscreen printing as they develop. Almost all of the custom equipment we use for wooden coin production is built of recycled plastics and metals reclaimed from disposal sites. We attempt to re-use and rebuild before recycle or reclaim and certainly prior to discard. We attempt to coordinate the process for maximum productivity of all products utilized. As a rural resident we utilize an independent system and so return nothing to city sewer networks. To save in redundant transport we offer a “Direct Shipping Options”. We will send the desired product directly to the end user with no reference to woodencoin.com in the accompanying paperwork. We then send the “Invoice”, “Shipment Launched Confirmation” with “Shipment Tracking Code” and “Statement” to the original purchaser. We can also add a “Gift Wrapping” option to the above “Direct Shipping Options”. Other than the “Gift Wrapping” option we utilize good pristine used boxes of various sorts for shipping of all products. An option for “New Boxes” is available at an extra cost. Copyright 2016 Woodencoin.com. All Rights Reserved.